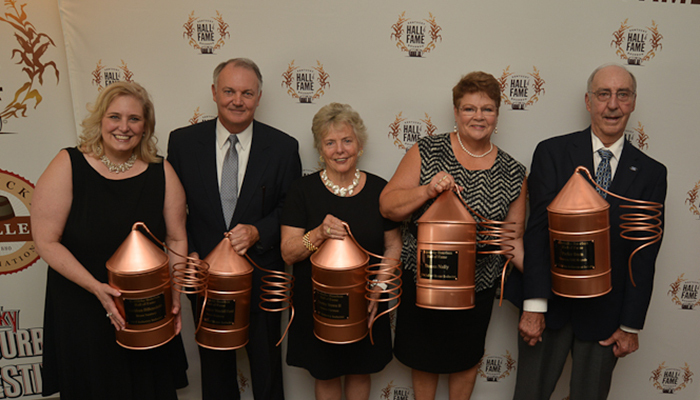 September 16, 2015 – The Kentucky Bourbon Hall of Fame inducted its 15th class of honorees during a ceremony at My Old Kentucky Home State Park in Bardstown as part of the kickoff for the annual Kentucky Bourbon Festival. Four new members were inducted into the Hall of Fame, while 2001 inductee Parker Beam received the Hall of Fame’s first Lifetime Achievement Award. The Heaven Hill Master Distiller Emeritus was part of the Hall’s inaugural class, and the new award will carry his name from now on. Donna Nally helped create the original visitors center at Maker’s Mark, and would have been a worthy candidate for that accomplishment alone. She was also one of the original founders of the Kentucky Bourbon Festival, and at a time when competing whisky producers didn’t usually cooperate with each other, she helped spearhead the development of the Kentucky Bourbon Trail. In her introduction for Donna Nally, Peggy Noe Stevens recounted an early planning lunch she hosted at Woodford Reserve for Donna and Doris Calhoun of Jim Beam. “I told the general manager I was having lunch with Jim Beam and Maker’s Mark today, and he said ‘well, what for?’ I’ll never forget that, and little did he know that we were putting together quite a grand plan that has been a pretty good idea,” she said. Inductees to the Kentucky Bourbon Hall of Fame are nominated by Kentucky Distillers Association members and the Kentucky Bourbon Festival and voted upon by the KDA’s board of directors.